We’ll always endeavour to get our customers in the best shoe. This will depend on a number of factors. Sometimes this will be as simple as the ‘appearance’ of the shoe and if you just want a comfortable shoe to walk around in, we have numerous options that could be suitable in an abundance of colours! More often than not though, runners (or somebody looking to run) will come to us for our advice and knowledge on the right type of shoe, and just as important, the right fitting shoe. The first question we’ll normally ask you is the ‘type of runs’ that you’re doing. This will give us an idea on the amount of mileage you’re doing each week and the terrain that you’re doing it on. If more than 50% of the run is ‘off road’, it is often advisable to look at an off road shoe. They will give more traction and generally be closer to the ground which will be more stable, particularly on rugged terrain. Some off road shoes are very grippy, which are great in slippery conditions. However, these shoes are not so suitable or comfortable on harder surfaces, and sometimes it is better to compromise a little on the grip if your run involves a mixture of surfaces. The amount of running you are doing and also your build can also be factors in the amount of cushioning one needs from a shoe. The requirements of an 8 year old running a couple of miles a week will be quite different to a big bloke training for a marathon! If the bulk of your running is on the road or a relatively firm surface, then you should be looking at a ‘road shoe’. 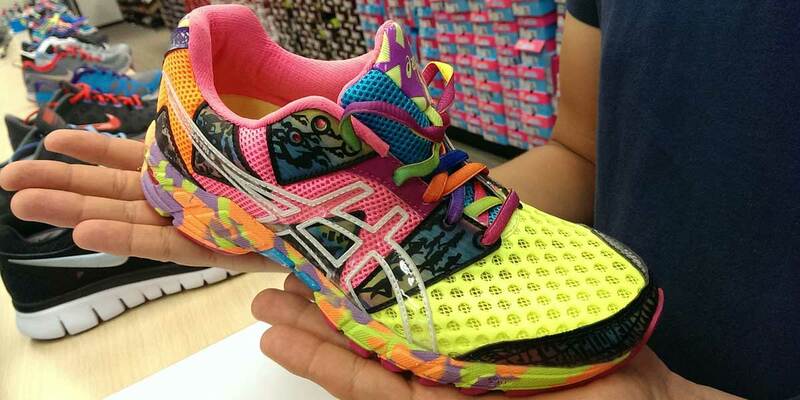 These will generally provide more cushioning and have a flatter outsole. The repetitiveness and linear direction of running, results in your foot strike being fairly similar ever time on a firm surface. Your running biomechanics are not so important when running off road because your foot strike is never quite the same and as a result, the majority of off road shoes are relatively flexible. More support or structure is often needed though for a road shoe. If you’re not sure what type of shoe you need, we’ll film you running on our treadmill and then analyse your foot strike. The main factors that can influence your choice of road shoe are the amount your foot rolls in (pronation) and where your foot hits the ground. Some degree of pronation is essential and it is NOT the major cause of injuries as was often thought. However, most people’s feet are not quite as strong as they should be, and as a result, need some degree of additional structure from the shoe, particularly when running longer distances. This might be some extra rigidity around the middle of the shoe or often a shoe with a firmer foam or plastic on the inside (a support shoe). There has been a lot of discussion over the last few years about how much cushioning we need in our shoes, with a lot of runners wearing more ‘minimal’ footwear. The argument against a shoe with too much cushioning is that it ‘dampens’ ones feel for the ground and can result in landing on the heel too much. We take a very pragmatic approach with minimal shoes. For a lot of runners, too little cushioning can be receipe for injury and as a result we often recommend a traditional shoe with good cushioning under the heel for runners who are used to that type of shoe and who have had no problems with them. However, we do believe that a lower profile shoe can encourage a better running style and stock a range of options that are suitable for the mid foot striker or for the runner looking to transition from a heel strike. As important as the right type of shoe, is the right fitting shoe. Different brands fit differently and some will fit the shape of your foot better than others. There is no point having the right type of shoe if it is uncomfortable! We always recommend a type of shoe and then encourage our customers to try on a few different brands to hopefully find the best one. So always be a little sceptical if you are told a certain brand is the ‘best’. No one brand is right for everyone, and as a result, we stock one of the biggest ranges of brands and models in the country.